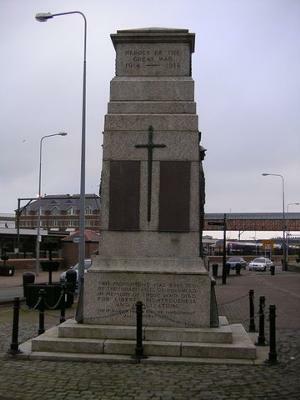 Holyhead's war memorial is a fine monument placed at the bottom of the High Street. You cannot fail to see the tower as you drive into the centre of town. Over looking the harbour it bears the names of many men and boys who died for liberty and justice. Names that illustrate the diversity of the Holyhead population., - Fox Russell, Mackay, Manning and Flaherty mingle with Hughes, Phillips, Jones, Williams and Roberts. Most striking is Brig. Gen. Gerald E. Holland C.B: M.G: C.I.E:D.S.O. Ordre De Leopold : Order of St. Maurice & St. Lazarus : Croix de Guerre. of those who live and visit there. was deemed to be the answer. An art centre rose from holy rubble. caused the audience to giggle. Let's raise our glasses and give a cheer. Oh happy day, oh Holyhead. of the messages of peace. let's hope the young people of Holyhead remember the sacrifice made by these good soldiers, sailors and airmen for their future.